Attention Disney Infinity fans. From Thomas Smith, Social Media Director, Disney Parks and posted on the Disney Parks Blog. Disney Interactive’s gaming platform Disney Infinity joined with Disney Parks to offer Walt Disney World Resortguests with a MagicBand a special surprise. 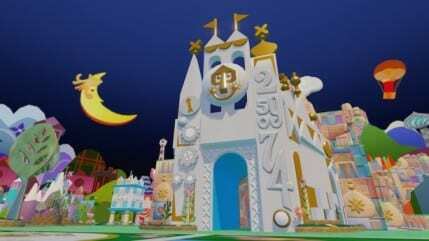 In the recently released edition of the game, Disney Infinity (2.0 Edition), only guests with a MagicBand can unlock the enchanting charm of the “it’s a small world” attraction into their very own Toy Box creation. Guests unlock the download of “it’s a small world” for their Toy Box by placing a MagicBand over the Disney Infinity Base. The Base will detect the presence of a MagicBand, and then will instantly unlock the “it’s a small world” download with no online connectivity required. Additionally, you’ll be able to enchant other players with the iconic music from the “it’s a small world” attraction in the background. Once you’ve created a saved game, you will always have access to the new content. MagicBands are part of MyMagic+, an exciting new way to experience even more of the magic of a Walt Disney World vacation. Disney Infinity is an interactive gaming platform that brings favorite Disney, Pixar and Marvel toys to life in a world without limits. With Disney Infinity players have endless opportunities to create stories and fun-filled adventures!